Foreword: This hunt began with an 8 hour drive from Lansing Michigan to Montreal Canada. Our car was politely, but professionally searched at the border. I had no problem with that. Nor would anyone who has seen my driver's license picture! We spent the night at a hotel in Montreal, and the following morning flew (3 hour flight) via Dash-8 turbo prop charter to the Inuit town of Kuujjuarapik. There we boarded a Twin-Otter for the short 45 minute flight to the Nunami outpost camp on the shores of magnificent Lac Mollet. Upon arrival at Nunami all the hunters were assembled for a short briefing. 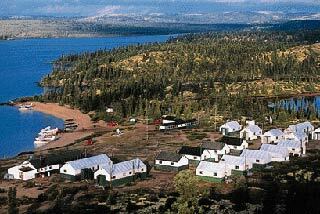 Cozy wood stove cabins were assigned, gear unpacked and at 6pm EST. dinner was served in the mess hall. Needless to say, that first night was all about Caribou dreams. Camp came alive at 6am and after a hearty breakfast of Crepes and sausage, we grabbed our gear and headed for the 18 foot boat that would be our mode of transportation during the week. Float planes are available, and part of an affordable package, but Dionn, who was to be our guide all week, wanted to use his boat for the maneuverability it afforded. It turned out to be a good decision. Our guide, Newfoundlander Dionn Skiffington, (half mariner, and half African tracker) was intimately familiar with the caribou and their migration routes. So after scouting the edge of a high hogsback, we decided to make our first set up in a low spot -- tamarack swamp -- where many of the caribou trails that paralleled the lake shore came together in a classic funnel. It was here I heard my first, "click-click" telltale sound of approaching caribou. Before long cows and calves were trotting by, and at least one huge P&Y class bull, that I managed to halt with a cow call. 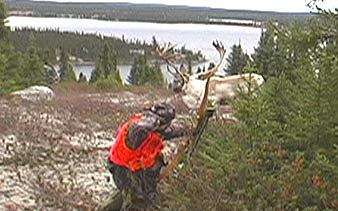 He pulled up right behind a spruce tree -- no shot. A few more cows and small bulls later, Dionn returned from a reconnoiter and said we should pack up and hurry to a different spot, higher up on the hill. We tried a couple more setups before opting to climb to the top of huge granite hogsback hill. Once on top we were treated to a breathtaking panorama of Mollet lake and the many cuts, bays, islands and peninsulas that made our view a picture post card. The top of the hill flattened into a lush lichen pasture dotted with boulders and spruce trees. And within a few moments we caught the movement of two huge bulls, feeding their way up the hill and into the lichen covered top. Three more steps; two more; one more step and the bull would be broadside at 5 yards. What a gorgeous day; what an incredibly beautiful hunting environment -- candy land -- could it get any better? Yup. The sight of my Muzzy tipped arrow buried to the fletch right behind the front shoulder was like dotting the "i" in a written prayer. The bull exploded in a blur of antlers and hooves, and headed on a downhill death run towards the lake shore. 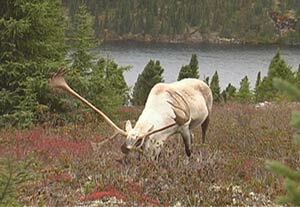 That evening, after being ceremoniously Knighted, I was given a Memento of my first caribou kill. This pin will remain on my HW Wool Vest as a reminder of a special hunt. You'll need Windows Media Player to view this file.